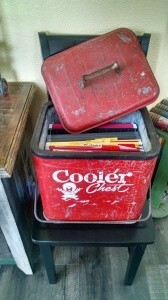 I've had this old Ice Chest for years and at times have used it at the store for display. I recently had an idea for it to use in the office room of our new home. I found a free standing file and cut it to fit inside of the chest and now I have a “Cooler” file box! Think about what else you can find to repurpose and have some fun with it. I have it all set up but still need to file my papers. I still don’t like filing, LOL! Very clever repurposing…and cute! I’d probably enjoy filing if it looked that great. Love your idea! But if it were mine, I’d use it camping, sitting outside our trailer, filled with ice and cold drinks for all! Thanks Jodi, Cookbooks would be great too! My guess was for cook books, That’s what I would have done with it. Your idea is much better! Your too funny… I liked your comment about the “Cooler” in front of the file! You should “make the time” (ha, ha, ha – like we have it this day & age) & contract labor out yourself with your great ideas for decorating!